This is the Arkeg. It's an arcade cabinet. With a keg inside. The pinnacle of human endeavour, then? I say...yes. 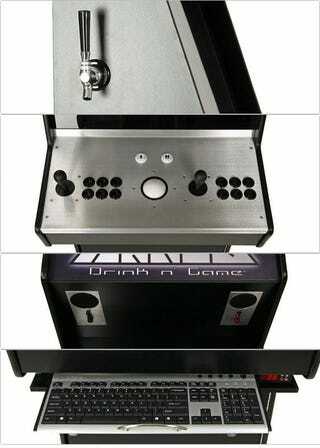 It's not some crazy mod; the Arkeg is a commercial product built to (presumably) a commercial quality, with temperature-control for the keg, external sound controls, a brushed aluminium finish, slide-out keyboard and even a trackball. A trackball! It comes with 69 games pre-loaded on the system, and these are properly included, with legal rights and everything. Plus, it's PC-based, so if you want to upload more games, you can. So, yeah, these guys are not kidding around. With their games selection or the price, with an Arkeg setting you back a cool, temperature-regulated $4000.